Game recaps, Nazem Kadri and Joe Thornton receive suspensions, the Flyers hire Alain Vigneault as their new head coach, and more in today’s NHL morning coffee headlines. NHL.COM: Power-play goals by Auston Matthews and Andreas Johnsson gave the Toronto Maple Leafs a 3-2 victory over the Boston Bruins to take a 2-1 lead in their opening-round series. Leafs goaltender Frederik Andersen kicked out 34 shots. The Leafs were also playing without center Nazem Kadri, who was suspended for the remainder of this series for cross-checking Bruins winger Jake DeBrusk in Game 2. SPECTOR’S NOTE: A much better team effort by the Leafs in this game after being manhandled by the Bruins in Game 2. They also did a fine job neutralizing the Bruins top line of Patrice Bergeron, Brad Marchand, and David Pastrnak. Kadri’s suspension could be between three-to-five games, depending on how long this series goes. Seems like he was fortunate not to receive stiffer punishment. Warren Foegele and Dougie Hamilton each scored twice and goalie Petr Mrazek had an 18-save shutout as the Carolina Hurricanes blanked the Washington Capitals 5-0 to narrow the Capitals’ series lead to 2-1. It was a costly win for the Hurricanes as rookie winger Andrei Svechnikov left the game with an apparent head injury following a fight with Capitals captain Alex Ovechkin and winger Micheal Ferland was also sidelined following a hit from Capitals right wing Tom Wilson. SPECTOR’S NOTE: Credit the Hurricanes for not getting rattled by losing two key forwards like Svechnikov and Ferland. They dominated the Capitals in this contest to pick up their first playoff victory since 2009. I saw some on Twitter scolding Ovechkin for knocking out Svechnikov but the youngster goaded Ovechkin and was a willing participant in that scrap. Here’s hoping he wasn’t seriously hurt and returns to action soon. Colorado Avalanche center Nathan MacKinnon scored twice in a 6-2 win over the Calgary Flames in Game 3 of their opening-round series (Photo via NHL Images). 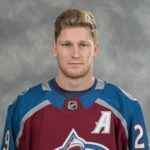 Nathan MacKinnon scored twice and rookie defenseman Cale Makar scored in his first-ever NHL game as the Colorado Avalanche thumped the Calgary Flames 6-2 to take a 2-1 series lead. Flames goalie Mike Smith made 50 saves in this one. SPECTOR’S NOTE: Credit the Avalanche for a strong effort in this one. They took control of this contest from the opening whistle in what was Calgary’s worst performance in this series. Giving up 56 shots in a playoff game is an unacceptable effort for a club that finished atop the Western Conference. Nashville Predators goalie Pekka Rinne made 40 saves to backstop his club to a 3-2 win over the Dallas Stars and a 2-1 lead in their opening-round series. Mikael Granlund broke a 2-2 tie in the third period with a long wrist shot that eluded Stars netminder Ben Bishop. Before the game, the Predators announced Wayne Simmonds (knee) and Brian Boyle (appendix procedure) are listed as week-to-week. SPECTOR’S NOTE: Rinne was hot and Bishop was not in this contest. Granlund and Rocco Grimaldi’s goals were stoppable shots for Bishop, who’ll look to return to the strong form he displayed in the first two games in this series. The absence of Simmonds and Boyle could hurt the Predators checking-line depth as this series goes on. NBC SPORTS: San Jose Sharks center Joe Thornton will miss Game 4 of his club’s opening-round series with the Vegas Golden Knights. He’ll serve a one-game suspension for an illegal check to the head of Vegas forward Tomas Nosek. CBS SPORTS/THE SCORE: Tampa Bay Lightning defenseman Victor Hedman (undisclosed ailment) and winger Alex Killorn (undisclosed injury) could miss tonight’s crucial Game 4 against the Columbus Blue Jackets. The Jackets hold a 3-0 lead in the series and could close it out with a win tonight. NBC SPORTS: The Philadelphia Flyers announced Alain Vigneault was hired yesterday as their new head coach. SPECTOR’S NOTE: Vigneault brings plenty of experience behind the Flyers bench as a former bench boss of the Montreal Canadiens, Vancouver Canucks, and New York Rangers. He guided the Canucks and Rangers to the Stanley Cup Final (2011 and 2014 respectively) and is a former winner (2007) of the Jack Adams Award. TSN: Edmonton Oilers winger Milan Lucic suffered a leg injury following practice the day before their final game of the season against Calgary. He’ll be in a cast for two more weeks and the injury isn’t expected to affect his summer training program. CHICAGO SUN-TIMES: Blackhawks right wing Patrick Kane was named the captain of Team USA at the upcoming 2019 World Championships. Very entertaining games in Toronto and Dallas…. both games could have gone either way; hard play right down to the wire. I fully agree that RInne outdueled Bishop and IMO the difference in the Leaf game was spectacular saves by Freddy. Rask was very good; Freddy was better. How many times in NHL history has that happened …. rookie D in first game that is a playoff game; scores a goal????? I’m still scratching my head re: no review of Ovechkin elbow directly to the head…. Jumbo Joe gets a game (warranted for sure) but Ovi’s hit doesn’t even get reviewed???? Excellent win by Canes and I’m very glad to see that the League finally stepped up and rescinded the grossly unfair call on Ferland …. that should have been done the first thing the next day… they didn’t need to wait 2 days!! Fair suspension on Kadri …. he stupidly went aggressive and cross-checked to the neck/face out of frustration. He was goaded and prodded all game but took the wrong resolution route and it cost him the rest of the series. I think the NHL screwed up the suspension Pengy. If it ends up being 5 games that’s fair I guess, but if it ends up being 3, which it could, then that is exactly the same as he got last year. How is that fair when you consider this is the 5th time he has faced league discipline for direct shots to the head. Set the bar high Naz, you are now the record holder in the NHL. Why not just give him 5 games? If they had given Wilson …. I’m a fair size (6’3”) and when I played I was 210…. you will never find a single person that ever claimed I did a body check to the head. I also never ever instigated a fight. Removing all body checks with head as primary point ; and all cross checks above the shoulders from the game …. count me in! Hope people enjoyed the obviously necessary part of the game that lead to a man getting knocked out. I know it really gets me revved up seeing two grown men act like toddlers on the ice. Actually. Come to think of it. They even give the players 5 minute time outs after their temper tantrums. Agreed Chrisms. Much better to settle disputes with a cross check to the face, like that stand-up guy Kadri. I didn’t realize those were the only two options in hockey. What a game! No doubt there are other options – anger management techniques, dispute settlement interventions and a host of other conflict resolution methods. Hockey would be a great game if only we could eliminate the violence. The women’s game is so much further along in that regard. The NHL should take note. Pengy I come at this from a different view. Personally that wasn’t entertaining to me. Boston once again didn’t play their game. Don’t know why maybe thought the refs where going to call everything but they didn’t throw any hits last night and if Boston isn’t going to bodycheck this series will be over in 5 games. Today the Athletic and NHL.com have a combined 5 stories on how Boston top line sucked and they did. Two points on this first give credit to Toronto line for shutting them down. That part didn’t bother me as much as they were bad on the PP couldn’t make a pass and they were bad on the PK. Not to often can you ever say Patrice Bergeron had a bad game but last night he had the worst game I’ve ever seen him play. Some will say it’s the speed of Toronto in part yes but these guys last night couldn’t make a pass, play or clear the puck when there was no pressure at all. It’s simple if Boston hits they win, if they don’t they lose. Need to play the game that got them here in the 1st place. Agree Caper, that is how they need to play against TO, but the B’s usually don’t run around drilling guys any more. Not the same team as 2011. But it is an advantage they have against the Leafs and are at a disadvantage wide open speed game. Agree on the turnovers as well. Other than Krecji and Heinen, who both seemed to be in control of their game, they fought the puck. The Leafs were extremely aggressive on the puck on the vs the PP on Bergy, Pastrnak and Marchand and the same 5v5. I think that is why we saw the Coyler’s line out their when they got a PP goal. They simplified it. Get it to the point in the middle of the ice and pound the net with shots and bodies. That should open up the middle for the seam pass. They were too predictable. If TO doesn’t force the point keep doing it. To many dangles and not enough puck support and movement. Time to dumb it down and start to get it behind their D and pound them. Need to create some turnovers. Old school time. I agree that Bruins were less “rugged” last night ; but the game was very close s I see it. I do think Freddy outplayed Tuuk; and yes Bruins were less gritty; but the game was close enough to go either way and that made it exciting for me. Another different perspective is that I saw the Leafs hit a lot more than they usually do, also saw them being a lot more aggressive in the corners and for the first time this year I was impressed with Nylander’s performance. The leafs aggression may have caused Boston to be taken a bit by surprise and throw them off their game plan. Jordan Staal did not have a goal last night but it may have been the best game of his career. His defensive game has always been consistent but he combined it with the most physical and intense game I’ve ever seen him play. Rod BrindAmour took advantage of the last change and got the match ups he wanted. I really like Rod the Bod as Head Coach. I’m pulling for Carolina in this series. Have to appreciate Svechnikov’s courage when he called Ovie on. But now I feel bad for both of them. Ovie didn’t really have a choice in that situation but to oblige/defend himself, but likely didn’t want to. Then he basically knocked him out. Now Svechnikov is likely out for a bit. Unfortunate, and in a perfect world I think Ovie would have liked to have the time to make a different decision, but what do you do when the guy keeps coming? In Hockey, such as in life, we should be careful what we ask for. The kid nodded and wanted what Ovie had, and what he had was Just too much for him. Great point Ray, I’d bet he feels s****y this morning. I don’t think anyone really wants to hurt a kid in a fight.